Our year started off with at NYE celebration at Sea World Orlando. On the first day of the year, we actually packed in a lot. We started off the day at Legoland Florida where we rode coasters and checked out some cool displays. In the late afternoon we experienced our first ever airboat ride at Boggy Creek Airboats. We finished the evening of the first day of 2017 at the Coca-Cola Orlando Eye. The 2nd day of the New Year didn't let up on the excitement level. We started off the day at Kennedy Space Center. We finished off our last day in Orlando at Fun Spot Orlando where we enjoyed White Lightning and the other coasters - along with the different go cart tracks. During February we shifted our focus from riding to watching new projects unfold. Time Traveler started to get extremely interesting with many footers appearing. 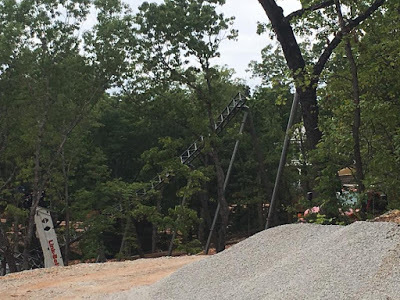 While at Worlds of Fun, new rides and a new front gate started to take shape. ...and over at Six Flags St. Louis, Spinsanity was being put together. 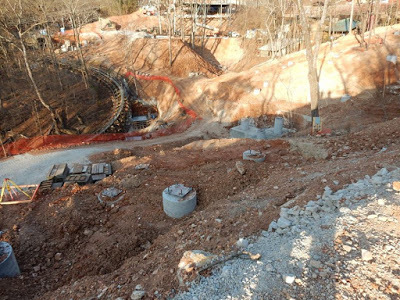 In March, SDC came out of hibernation for a new season. Later on in the month, Six Flags St. Louis also started a new season. Spring Break took us to Texas this year. We started off our Lone Star State tour at Kemah Boardwalk, home to the Boardwalk Bullet. Next we headed to Galveston Island to visit their famous Pleasure Pier - home to the Iron Shark. While on the Space Coast, we couldn't pass up visiting Space Center Houston. Moving on down the state to San Antonio we stopped by Sea World. We also got to experience our first Free-Fly Coaster at Fiesta Texas. While at Fiesta Texas we also go to enjoy the Mardi Gras Festival that was going on at the park. Spring Break carried over into April and I got to spend my birthday at the original Six Flags park - Six Flags over Texas. Worlds of Fun finally decided to open for the season in April, but the new rides were far from being ready to open. Mid-month we got to visit the Gateway Arch which only just reopened for tours to the top. and Silver Dollar City having festival celebrating this delicious food. Six Flags St. Louis debuted Galactic Attack, yet another VR overlay for Ninja. We finished the month getting to ride the new The Joker roller coaster at Six Flags Great America. Spinsanity FINALLY opened at Six Flags St. Louis. We're still not sure what took them so long to get the ride functional. and the NEW Norma's Funnel Cakes building opened at Worlds of Fun. Six Flags also debuted the brand new Mardi Gras Festival. We're still unsure why it was it was held in June, but it was a fun festival nonetheless. We also visited SDC to visit their Summer Festival. 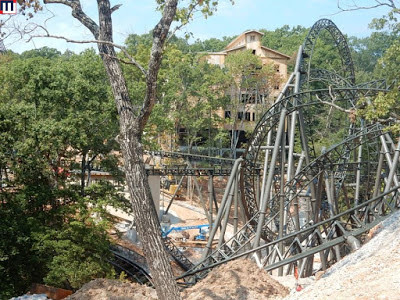 In other news, Time Traveler hung its first pieces of track. Our Summer vacation took us East this year and started with a brand new park for us - Camden Park which is located in West Virginia. At Busch Gardens, we got to ride the new GCI wooden coaster InvadR. We visited Kings Dominion where we got to ride some of our favorites including Volcano and Dominator. We stopped in at Six Flags America to help the Wild One celebrate it's centennial year. We made a stop at Dorney Park to ride some awesome coasters including Talon and Steel Force. I also got to visit one of my favorite parks - Knoebels where I rode the new Impulse and the famous Flying Turns. I also found out that there IS a limit to how much the park will allow you to snap their flyers and yes I was told to cut it out. I also finally made it to Morey's Piers. Another "must visit" checked off my bucket list of parks that I want to visit. I did visit all three piers - and really enjoyed riding the Great White. We continued our trek to major parks in New Jersey with a stop at Six Flags Great Adventure to ride Kingda Ka, Zumanjaro and another Free-Fly Coaster. We also took the Off Road Safari while we were at SFGAdv. At Hersheypark we got to choose which S&S tower we wanted to ride. We also stopped by the Boardwalk at Hersheypark for a splash or two. We also made a stop at Chocolate World before moving on. We finished our very long (and action packed) vacation at Kings Island where we got to experience their new GCI coaster Mystic Timbers. and Holiday World. We always have a great time here. Speaking of Time Traveler, it continued to grow with regards to track placement. September brought about the Fall Festivals like this one at SDC. November brought about the start of the holiday season. Silver Dollar City stepped up their game to a new level with the addition of Christmas in Midtown. Six Flags St. Louis brought back Holiday in the Park for a second season. Not to be left out on the holiday fun, Worlds of Fun debuted their own event, Winterfest, for this season - marking for the first time ever, all three Missouri parks having extended seasons. December started off big with a trip to Walt Disney World with my choir. Our first day was at Animal Kingdom. We were also able to check out the new Pandora - the World of Avatar section - and yes, the Flight of Passage was amazing. The second day we visited Epcot. The main reason we were even at WDW was the Candlelight Processional. A select group of my choir joined the mass choir for the 5pm performance on December 2nd. It was quite the experience and we plan on doing it again soon. Our third day at WDW was spent at the Magic Kingdom, where I finally got to ride the 7 Dwarfs Mine Train. It sure is a lot of fun, though I wish it was longer. That night was spent at Mickey's Very Merry Christmas Party. It was a fun event filled with some great entertainment and way too much sugar (in the form of cookies, snacks, and egg nog). Our final day at WDW was spent at Hollywood Studios. I honestly cannot get enough of Tower of Terror and Rock 'n' Roller Coaster. I cannot wait for the new additions to open. Back home in Missouri, Time Traveler started testing. 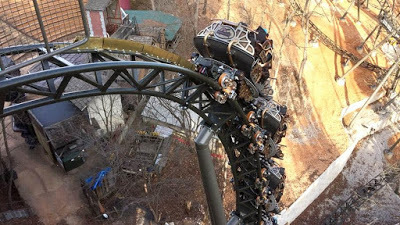 The ride doesn't open to the public until March, but it has already had its first riders. We closed out our park season at Silver Dollar City with one last viewing of the Christmas shows. We also finally got to take a ride on the Branson Ferris Wheel. This is a great addition to the 76 skyline. Our final new coaster of the year was the Branson Coaster. This is also a great addition to the city. I definitely will be back. We want to thank everyone for their continued support and viewership of Midwest Info Guide. Without you we would have never made it to 20 years of updates. Here's to many more years of updates and fun. Happy New Year and Happy 2018 from the staff at MIG!